Note: You can enter this giveaway one (1) time per e-mail address per day. Deadline is 11:59PM ET 11.13.18. Plates overflowing with chewy chocolaty cookies, bubbly sweet fruit pies steaming from the oven, crumbly decadent cakes poised on a fork. 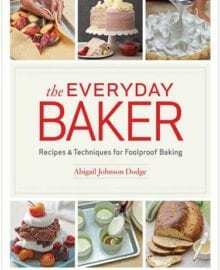 Turn on the oven, get out your mixing bowls and bakeware and make every sweet treat an award winner with Abigail Dodge. This impressive collection of recipes will guarantee success for all skill levels, whether you’re looking to improve your baking knowledge or just getting started. While you’re dreaming of flaky pastries and velvety indulgent puddings, a lovely mug of apple spiced bourbon toddies will keep you warm on a cool fall evening. NO PURCHASE NECESSARY TO ENTER OR WIN. Void where prohibited by law. Open to legal residents of the 50 U.S., D.C. and Canada (excluding Quebec) who are at least eighteen years old at the time of entry and have internet access. Begins on 10.23.18 at 12:00 a.m. ET and ends on 11.13.18 at 11:59 p.m. ET. To enter this giveaway, submit your full name and email address on this form. Odds of winning this giveaway depend on the total number of eligible entries received. Only one (1) entry per email address per day. Sponsored by Leite’s Culinaria, Inc. For more information, visit our Official Rules. For a list of winners, check out our Very Happy Winners page. Be sure to add giveaways@leitesculinaria.com to ensure notification if you are the winner.